Published 2 July 2017 by Anomaly Works Press NYC. The collection of stories that make up what we call our identities is often divided into numerous, somewhat cohesive, larger histories. Within these mythic sections there are smaller chapters, whose various segments are interlocked with spun tales, adventurous episodes, dramatic scenes, romantic chronicles and mundane reports. Held together by memory, that carnival house mirror, we adjust the pages and polish the cover, adding new pages with every passing day. Very few events, only those on the scale of births or deaths, truly shake up that basic narrative we carry of who we are. In March of 2017, two tightly intertwined stories from many decades past, ones that I had assumed I would never know the resolution of, were suddenly pulled like rabbits from a hat. The revelations brought with them perspective-shifting joy, as well as shades of profound horror. I felt the need to hold together these experiences, to bind them into my collection of life stories, and so have put together this small book. 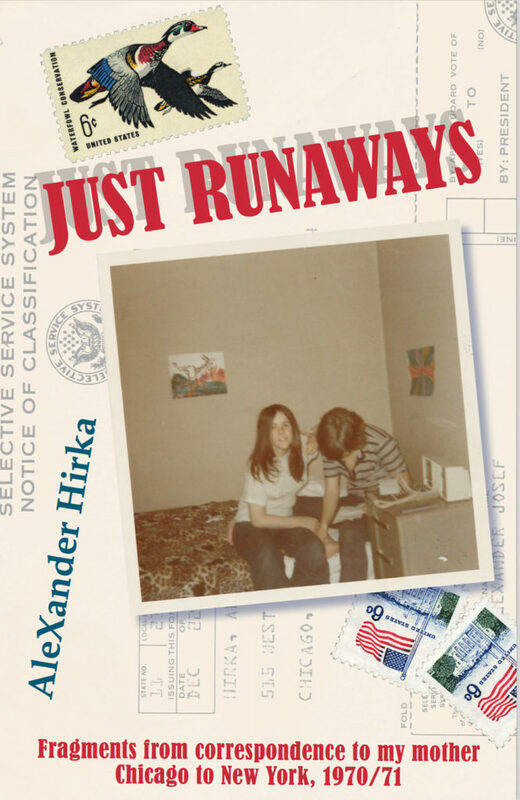 Assembled from shuffled non-linear fragments, culled from the letters I wrote to my mother during 1970 and 1971, it is a simple glimpse into the innocence, fear, joy and quotidian diversions of two young people. The story begins on 8 February 1970 when I left New York City with my girlfriend Gail – me fleeing the Selective Service draft, her an abusive father – and ends, and continues, in March 2017.